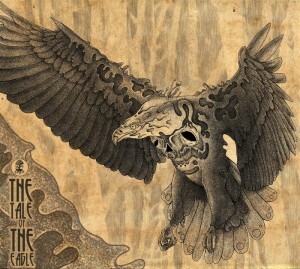 Mushroom Hunters proudly presents The Tale Of The Eagle, a mythical story about one of the oldest pagan tribes on earth. This time we take a deep dive into ancient rites and pagan beliefs, where nature takes hold of you, giving a real taste of a journey into the core of spiritual states of being. Compiled by label founder Carbuncle, this release features nine unique tales that come together to create an extraordinary musical experience. Let your soul and mind travel through the most strange and yet unknown paths of nature! Mastering by Makus @ Overdream Studio with artwork by Arian Rrecaj. MP3 Download | FLAC Download | WAV Download · Download count: 14,830. I really enjoyed Release The Kraken, one of the better Darkpsy releases this year. Metaphyz is one of my favorite, recently discovered artists. I am excited to hear him play again, especially in a Forest VA. The Svavel track is unique, twisted and extremely deep psy trance. !! Fat beats! Rich atmosphere. Digging it. Great compilation. Very atmospheric. Propa!!! Had an amazing experience on Metaphyz’s track last night.. All of his tracks are just oozing with quality! This compilation is really really awesome!! Congrats for label for choosing tracks . I did try to make a list of favorites tracks but almost everyone is very, very good ! Damn that’s Delicious Indeed. Very Good.